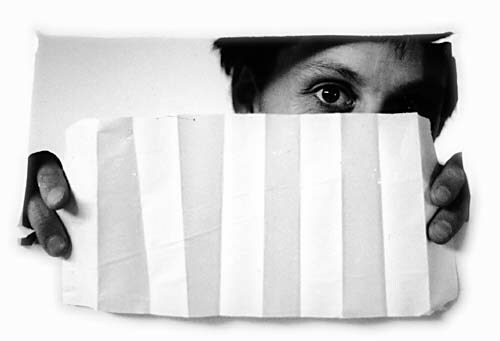 Since 1995 the Papiertheater has been exploring the visual, acoustic and dramatic potential of this very material. A huge paper surface stretches across the stage and stands between audience and actors: it serves as a screen that could be painted or projected onto, a wall where holes and windows are cut or torn from, a surface that gives birth to objects by being fold and bent. The shows are based on visual language and therefore do not need many words. The Papiertheater is a company and thrives on the collaboration of various art forms: musicians, sculptors, puppeteers and storytellers engage in paper affairs. The results travel around the earth. The Papiertheater runs its own publishing company: Erlesene Bücher (Exquisite Books) , which focuses on selling hand-made unica at booksellers’ prices. For orders or inquiries please contact the Papiertheater. Storyteller at home and abroad. Guest and permanent engagements as a puppeteer and director. Co-founder of Theater Lakritz and Theater Kranewit. Photographer, children's hands e. V.
Wilfried van Poppel: Founder of "DE LooPERS" dance theater for children and adolescents. Co-founder of Dance4Life Bremen, Germany - an international youth campaign against HIV and AIDS. Works as a choreographer, dancer and pantomime player in many projects. Amaya Lubeig: studied Modern Dance at the Instituto de Teatro y Danza in Barcelona and Folkwang Hochschule Essen. Since 1992 she was a member of the Tanztheater Bremen by Susanne Linke and Urs Dietrich. Currently a freelance dancer.